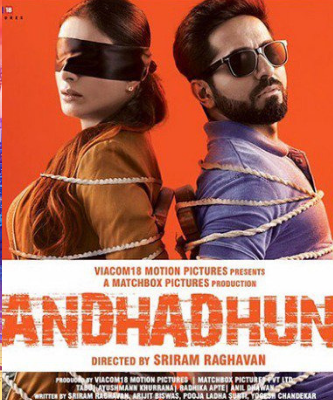 Andhadhun is comedy thriller Indian hindi film. It was released in 2018. Ayushmann Khurrana, Tabu, Radhika Apte played lead roles. Anil Dhawan, Zakir Hussain played supporting roles. It was directed by Sriram Raghavan and produced by Viacom 18 Motion Pictures, Matchbox Pictures. Music composed by Amit Trivedi, Raftaar, Girish Nakod.